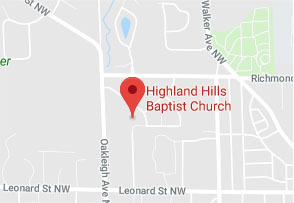 Highland Hills Baptist Church is a Community of Believers covenanted together for the purpose of glorifying Jesus Christ. We gather to worship God, give attention to His Word, and minister to one another. Through the enabling of the Holy Spirit, we desire to live in obedience to all of Christ's commands and to bring others into faithful discipleship. Want to see more events, or need more information?